These things come in cycles. Vodka was trending in the 2000s with Grey Goose becoming the drink of the decade. Now it’s gin’s turn…not that the drink is new. In fact, the spirit was first imbibed as a herbal medicine in the middle ages. But today, people are drinking more of the liquor than ever before. 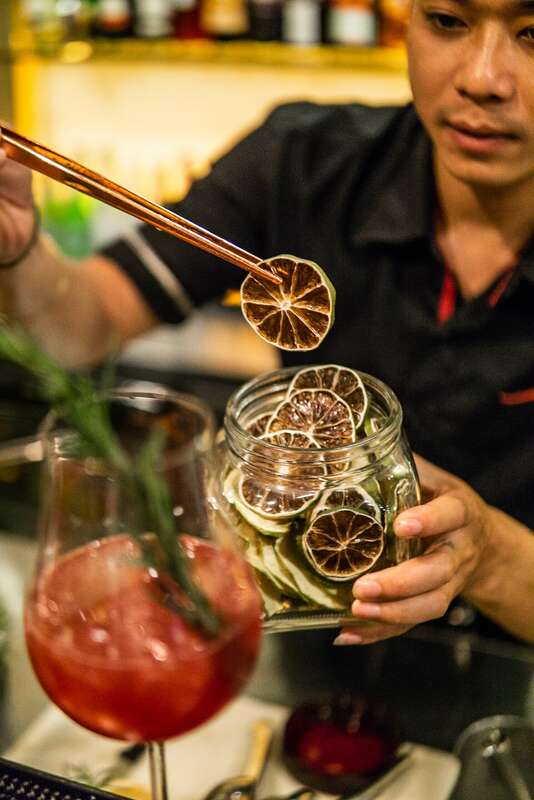 Gin Fest Saigon is bringing together fourteen bartenders (and seven different gins from the historic Bols Genever to the no-fuss No.3 London Dry Gin) at Ho Chi Minh City’s first official celebration of the juniper drink. That gave us chance to check in with the fourteen bars lending their prized bartenders to the competition. Here, in part two, we present the second group of seven. Some of the competing cocktails from this group are colorful, and lots take inspiration from the bartenders’ childhoods and hometowns sometimes far outside of the city. 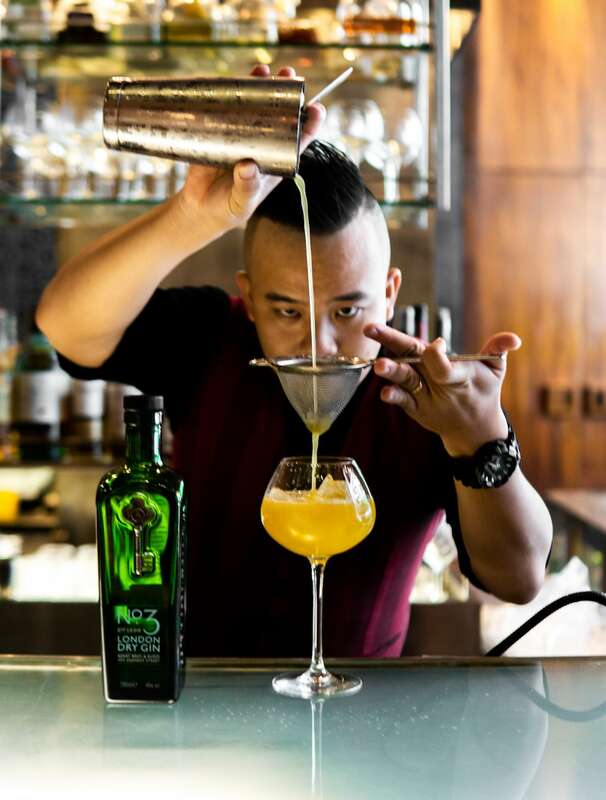 Gin Fest Saigon brings together fourteen of Saigon’s best bartenders who are passionate about the juniper drink. 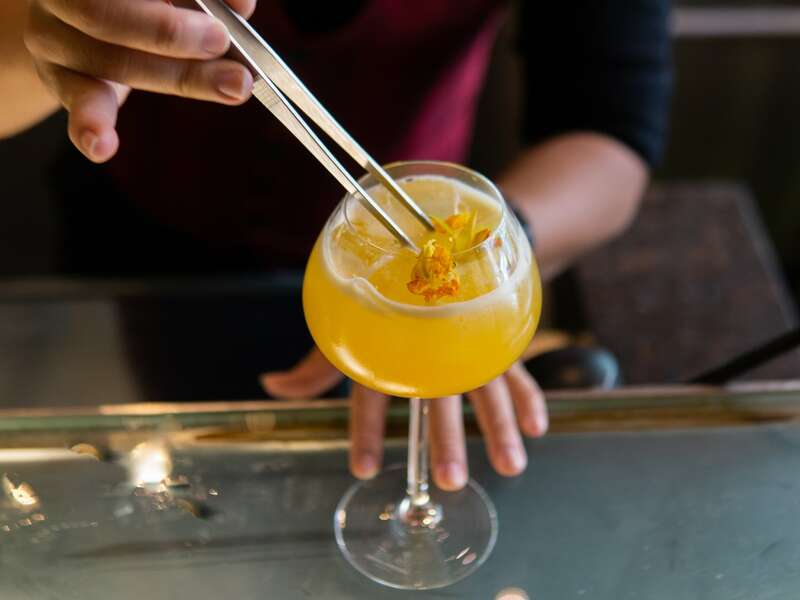 Tim Nguyen Thanh Phuc’s No.3 De Fleurs incorporates flavors from the bartender’s childhood like passion fruit and honey. 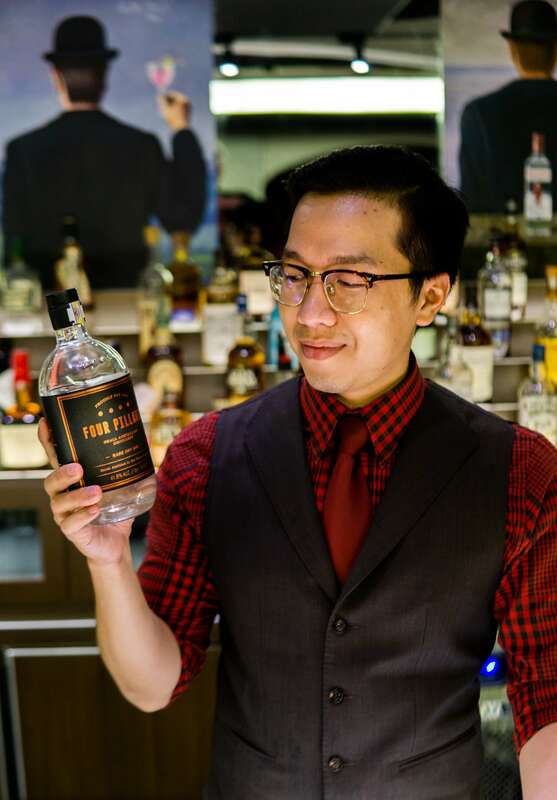 Tim Nguyen Thanh Phuc has conjured up the perfect tribute to his childhood—the No.3 De Fleurs cocktail that he’s serving at the Park Hyatt’s 02 Lam Son Bar. 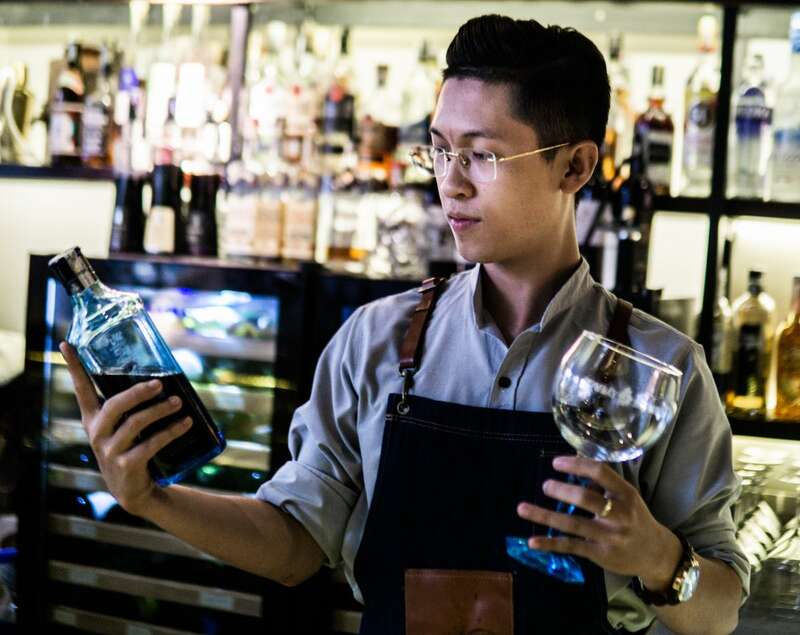 While the No.3 London Dry Gin has juniper at its heart, at the heart of Tim’s cocktail is Saigon itself. “I grew up here in Saigon,” the bartender begins. “I remember when I was 11 or 12 years old, and I had a sore throat. My grandma gave me some sweet honey mixed with sour passion fruit…and I felt better straight away,” he smiles about the ingredients he’s incorporated into his No.3 De Fleurs. In Short: A classic London Dry Gin by way of the Mekong. Dat Nguyen’s The Dreamer contains 30ml Four Pillars Gin, 20ml pandan-leaf infused vermouth, 5 dashes of herbal liqueur, 2ml of coconut liqueur, and it’s topped up with Thomas Henry tonic. It’s a surprise to find the avant-garde classic cocktail bar The Rabbit Hole hidden beneath Ngon Restaurant on Nguyen Thi Minh Khai Street. “Lots of guests have been surprised trying my drink, The Dreamer, too,” head bartender Dat Nguyen begins. “They’ve told me the fruity, sweet, spicy, and creamy elements are like an explosion on their palates,” he continues from behind the L-shaped bar. 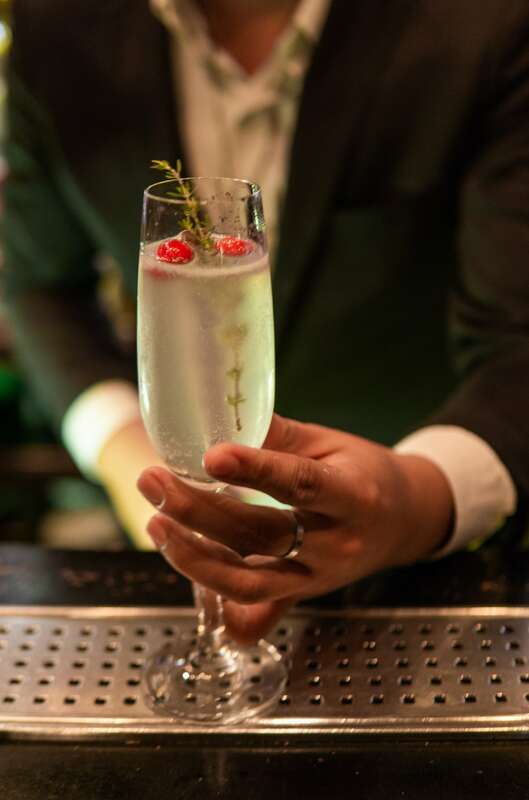 “Passion and love are such dreamy sentiments so I called my drink The Dreamer.” — Dat Nguyen. Dat adds a special ingredient to the Four Pillars Gin—his Martini Bianco infused with pandan leaf “that creates this fatty aftertaste that goes well with the spicy notes in the gin.” The head bartender also adds herbal and coconut liqueurs before topping the drink off with Thomas Henry tonic. In Short: An explosion of fruity, sweet, spicy, and creamy ingredients. The Gin House have 125 gins including the Mexican gin, Mezcal MG, and the Spanish gin, Botanic. Plus there’s 30 bottles they’ve infused themselves. 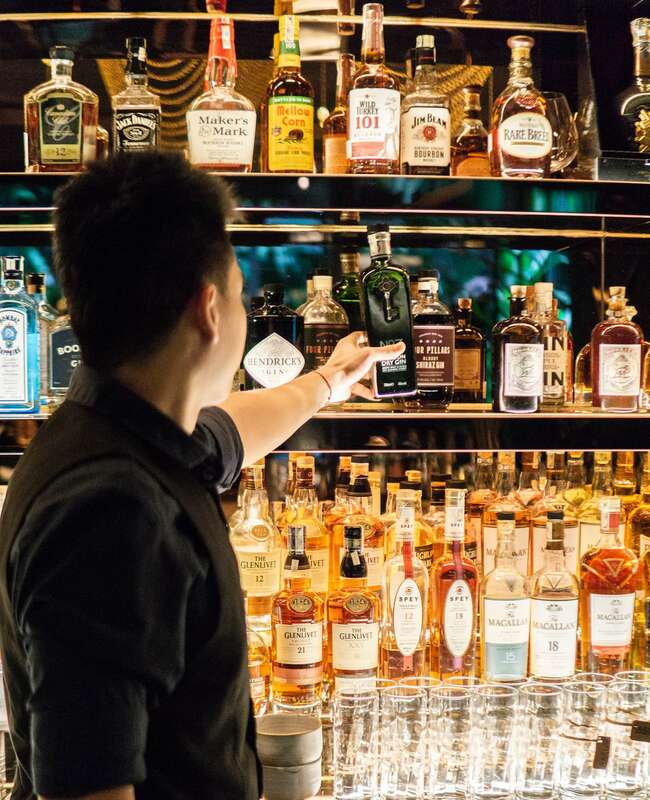 “We have around 125 gins from around the world and 30 infused gins we’ve created ourselves,” Trung Nguyen says looking up at the shelves at The Gin House. There’s the standard serves like Hendricks—“still one of my favorites, simple and clean”—and some unusual gins like the Mezcal MG, a Mexican small-batch gin made from “mountain spring water, wild Cenizo agave, [and] traditional and local organic botanicals.” Then there’s the Spanish Botanic Premium London Dry Gin that’s stored in oversized perfume bottles. It’s the speakeasy’s second birthday. It’s taken a little time but the recognition is starting to roll in for these bartenders and this bar that’s in an alley off the shoppers’ paradise of Nguyen Trai street. 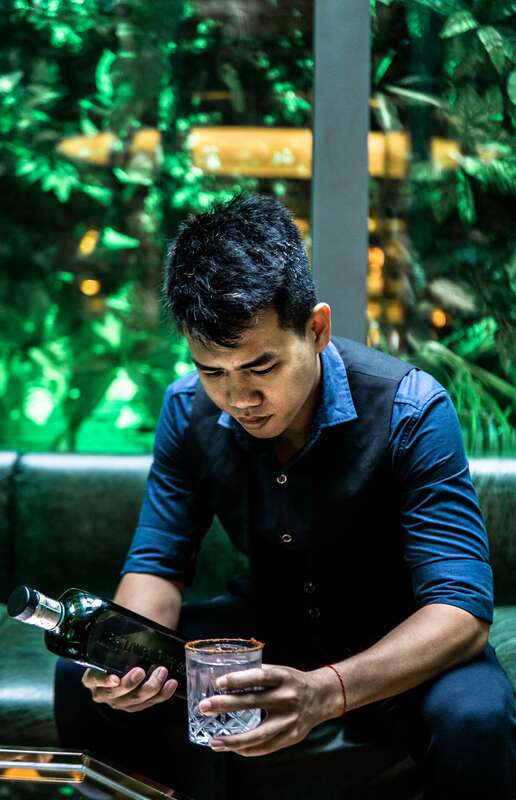 Trung Nguyen will be going to Istanbul in September as the Adventurous Asia Champion for the Opihr World Adventure Cocktail Competition. And he’s one of the fourteen entrants to Gin Fest’s cocktail of the year competition. 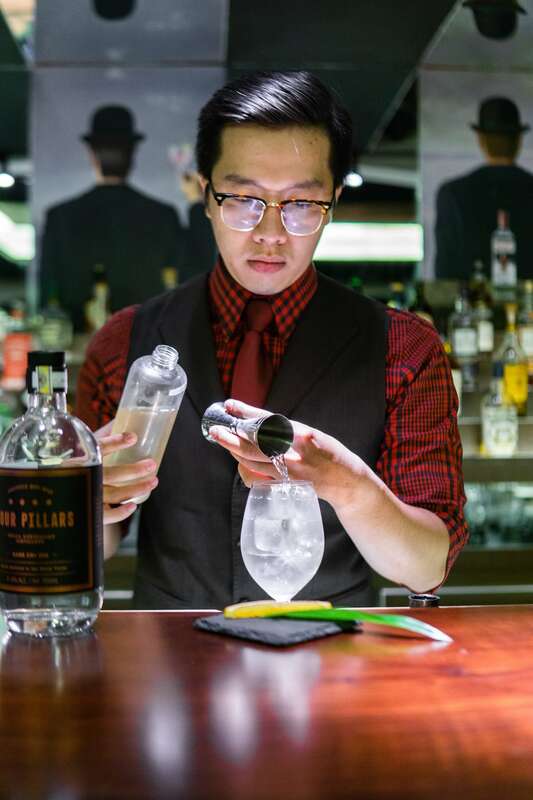 “I should place in the top three,” Trung smiles confidently as he sets about making his cocktail. Trung Nguyen’s Lola is a lightly sparkling sour, sweet, rose-scented tribute to a German girl he once kissed. For this event, he’s using the Riesling-grape infused Ferdinand’s Saar Dry Gin. It’s a tribute to the memory of kissing a German girl called Lola whose name he’s taken for his drink. “Imagine she’s the girl of your dreams and she’s just had a glass of Riesling wine. 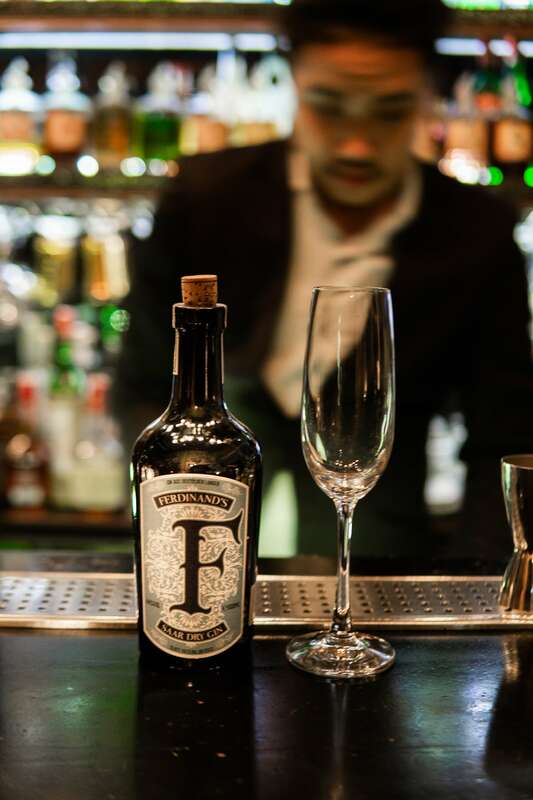 Kissing her would be slightly sour, a bit sweet, tinged with the aroma of roses—all flavors you can find in Ferdinand’s Saar Dry Gin,” the bartender laughs. “Was Lola a real person? Yes, we kissed once in a bar in Saigon and then she was gone,” Trung adds sadly. In Short: A lightly sparkling sour, sweet, rose-scented tribute to a German girl called Lola. 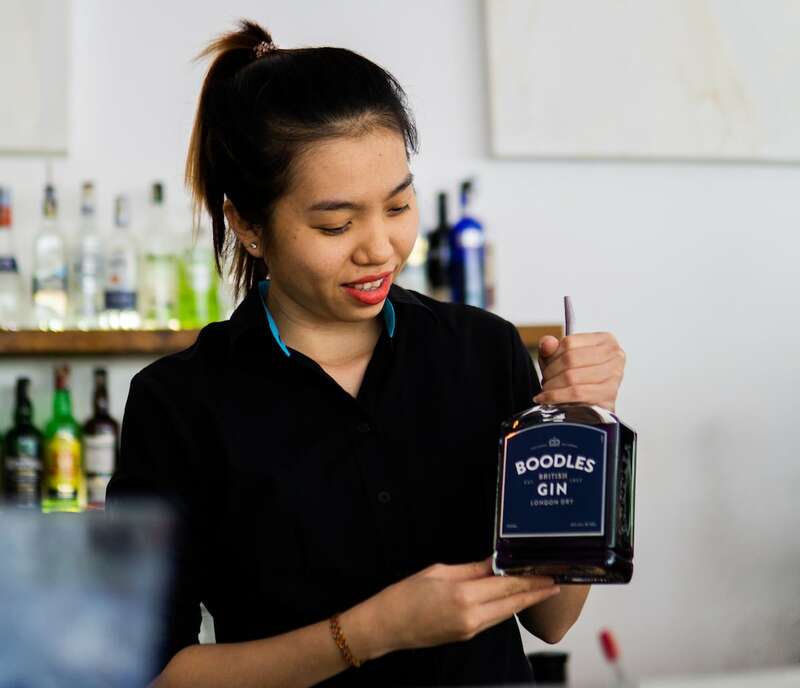 Nguyen Kim Ngan in the bright, airy Mediterranean restaurant, Lubu, holding her Boodles gin infused with butterfly pea. Nguyen Kim Ngan created her Butterfly Pea in District 2, at the bright, airy Mediterranean restaurant Lubu. “It’s like my second home,” Kim smiles. Butterfly pea is an ingredient that’s native to Southeast Asia where it’s used as a natural food coloring. Malaysians give the rice in their kuih ketan a bluish tint with it, and in Thailand and Burma the flowers are sometimes deep fried and eaten as a snack. Kim finishing off her floral gin and tonic with lemon, raspberries, and lavender. 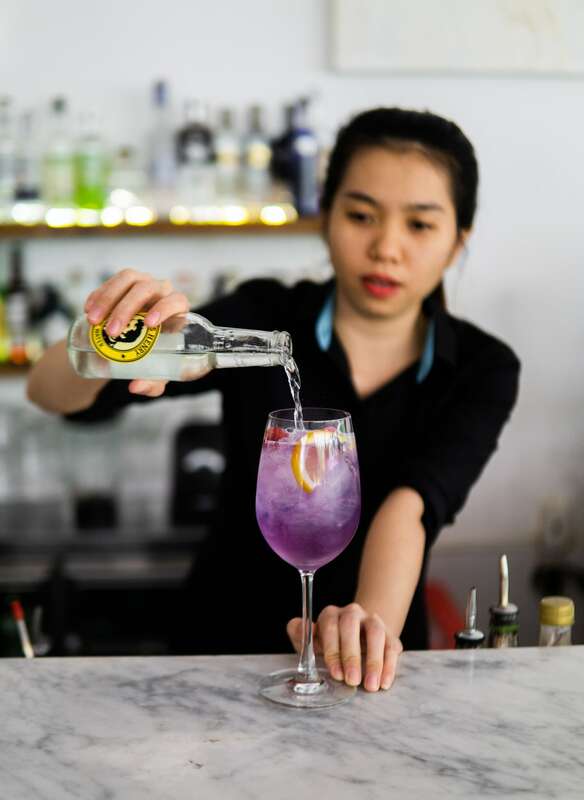 “Growing up in the countryside, I always remember that flower,” Kim explains, “I was surprised to find it again here in Saigon.” At Lubu, Butterfly Pea is turning her Boodles Gin purple. But something magical happens when the drink is poured—the rich magenta color turns pink upon contact with tonic water. In Short: A floral gin and tonic made with a seductively colored gin that’s strong like its creator. Bii Nho is from Dak Lak in the Central Highlands. His Asia’s Lava is inspired by the thick jungle and bright colors of his home. Le Van Quynh, or Bii Nho as he prefers to be known, comes from Dak Lak, “but I’ve been in Saigon for five years now,” he explains. “Dak Lak province is a place filled with brilliant colors and thick jungle,” the bartender remembers. Xu Restaurant and Lounge has been a leader in creative Vietnamese gastronomy for over ten years. Now, Bii Nho is adding another creative item to the menu—his Asia’s Lava cocktail—that’s inspired by his childhood in the Central Highlands. Bii Nho’s bright red cocktail that takes its color from his homemade hibiscus jam. Hibiscus is a such a common sight in the Highlands “that it’s become a symbol for the region,” Bii Nho explains. Key to his Asia’s Lava is his homemade hibiscus jam. “The taste gives me so many recollections of my childhood,” he adds as he mixes the jam with Bols Genever gin, lime juice, and some mint. He adds a rosemary garnish for good measure, then slides the drink over to us across Xu’s bar. In Short: A Central-Highlands-themed cocktail with sweet hibiscus jam. 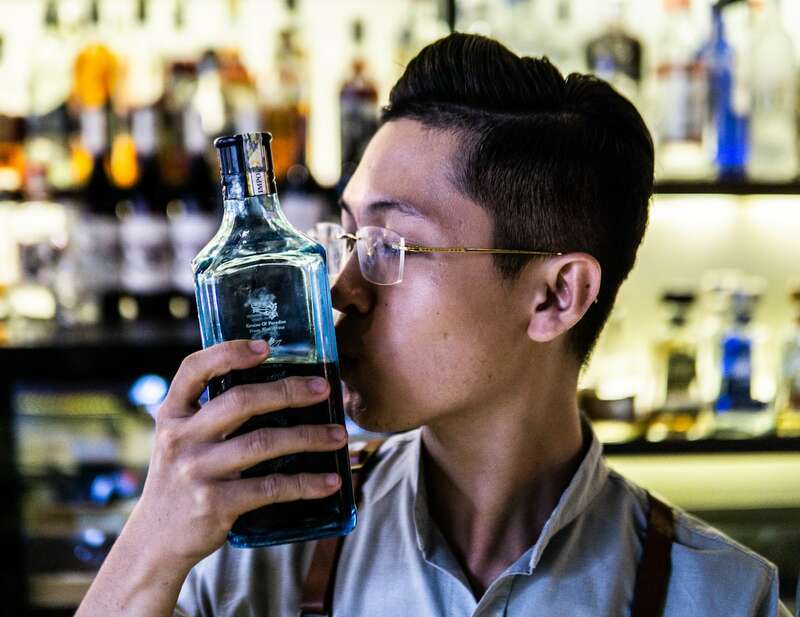 Dinh Thep, Layla’s bar manager, gets ready to make his Purple Sapphire that’s built on a base of Bombay Sapphire gin. Layla’s bar manager Dinh Thep is giving Gin Fest 2018 another colorful cocktail—his Purple Sapphire. “Purple’s a powerful color,” Thep says of the cocktail’s deep hue. It gets its color from the Vietnam-grown black goji berries that he infuses his Bombay Sapphire with. 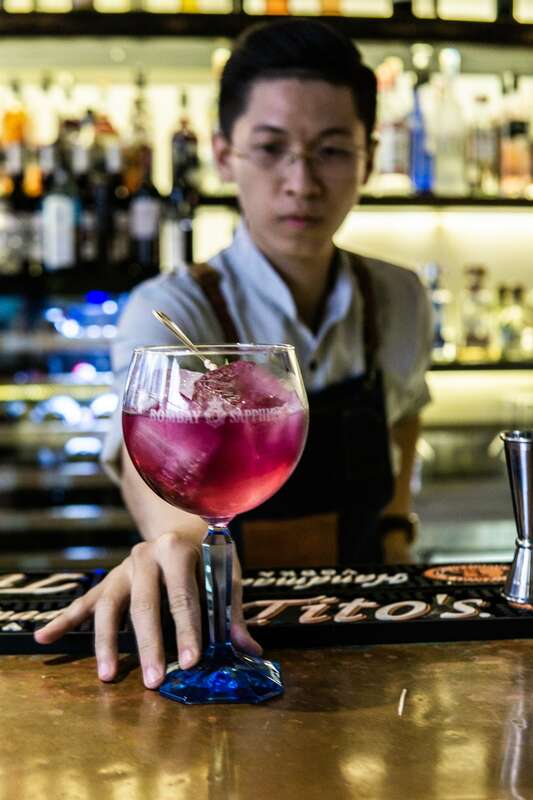 Dinh Thep slides his Purple Sapphire across the bar, it’s a fruity floral version on the traditional gin and tonic with a colorful goji-berry infusion. Ingredients: 30ml of Bombay Sapphire infused with black goji berry, topped up with Thomas Henry elderflower tonic, and garnished with raspberry, lime and cucumber. In Short: A fruity floral version on the traditional gin and tonic with a colorful goji berry infusion. Alley50 is an adventure—even before you meet the safari-suited staff inside the bar. The entrance is down an alley off Mac Thi Buoi, but fortunately there’s a team on the street to guide you in the right direction. Once inside, there’s extravagant jungle decor and opulent Singaporean-led interior design. And they’re making some creative coolers—like Chau Nhat Quang’s cocktail the Shiso No.3. “I still remember the first time I touched a cocktail shaker, during my internship at the Majestic Hotel,” Quang remembers. 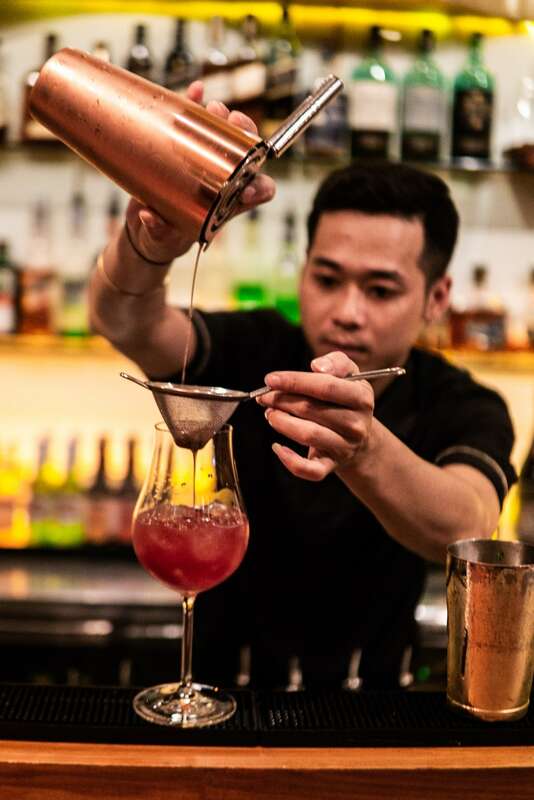 Following that, the bartender spent two years in Phu Quoc and returned to work at the Park Hyatt Saigon. “I learnt so much about maintaining five-star standards there,” he adds. Quang holding the No.3 London Dry Gin and his cocktail, the Shiso No.3, surrounded by greenery in Alley50’s jungle-themed bar. 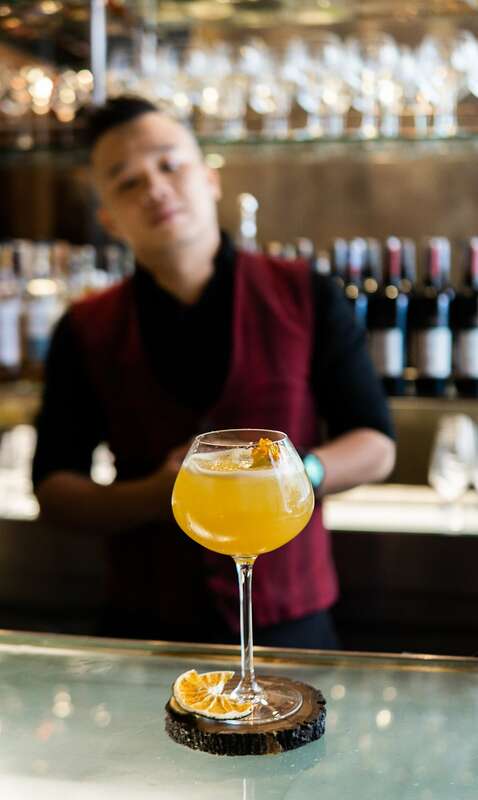 To the classic London Dry Gin, No.3, Quang adds some spiciness—from the chili salt he rims the glass with—and freshness, from the combination of shiso syrup and Thomas Henry kumquat tonic. “Everyone’s drinking gin right now, so I’m always experimenting with variations of the classic gin and tonic, like this,” he adds. “Despite the flavors I’ve added, it should still retain the taste of gin—it’s the perfect refreshing drink while you’re in the jungle,” Quang laughs looking around at the Alley50 decor. In Short: A fresh and spicy gin cocktail to cool you off with a spicy kick while you’re in the jungle.